great, too! Let's see how many things we can get out of drawers and onto display! Yes, it is that time of year where we need to renew our dues for 2015-2016. We need to have everything to EGA National by the end of May. I will be asking everyone to have their dues paid to me by May 15th. This is because the Treasurer and I need to get everything together and sent to National before then. As a side note, I will be leaving on vacation the last 10 days of May, so that means I need to move a little quicker. Even if you joined us in 2015, you will still need to renew your dues because your joining fees only covered you until the end of May. For those of you who have paid your renewal dues already because of Meg mentioning it in her President’s Letter, thank you. You are quick! To pay your dues, please go to our website, www.CyberStitchers.org; and find the STORE button in the upper right hand corner. Then choose your appropriate tab and follow the prompts. You will notice that the dues tab reads, April – June. Not to confuse anyone, this is for April 2015 - June 2016. Most chapter payments can now be done through our website. You can process payment for your dues, register for your BEEs classes, etc. EVERY dues payment will have to be entered on the website so that we can 'process' it. This is mostly for record-keeping purposes, but it is vital that you follow the proper procedure so we can account for every member of our chapter. Payment through the website's shopping cart (or "Store") will generate a receipt for you. Again, on your check please write your EGA#. With our large membership it will make life a LOT easier on any of our volunteers that need to handle payments. If you have any further questions, please feel free to contact Rita at membership@cyberstitchers.org. If you don't already know, the chapter has a Facebook page: https://www.facebook.com/cyberstitchers If you are on Facebook and haven't "liked" our page, please do so! Also, please 'share' and 'like' the page's posts on your timelines to spread the information to your friends (and your friends' friends). We like to 'spotlight' our chapter members on the blog, so let me know when you see members teaching at seminars, published in magazines, winning ribbons/award! We are proud of all our members, so let us know what's going on so we can share it with the whole chapter. And don't be too shy to toot your own horn! You can pay via www.paypal.com paying cyberstitchers@excite.com. Just be sure to identify "Chapter Pin" somewhere in the payment information. For now, no checks please. Please email me for my mailing address, or just click on my name below. I will need your mailing address. As soon as I see payment, I will get your pin out to you. SIGs are Special Interest Groups and we have a lot of them and more coming all the time. Here are the ones we have at present that you are welcome to join. Feel free to check them out and join the ones that interest you. Remember, they are only as active as the members make them. Talk, visit, stitch but don't just lurk. That is not fun for anyone! PLEASE LEAVE YOUR NAME WHEN YOU ASK TO JOIN as it is easier for all of us to check your membership that way. Searching on email addresses is not always possible and frequently frustrating and often gets members rejected for no reason except "not found in database." If you have any questions, feel free to ask me. If I don't have the answer, someone else here probably will. These groups are only as exciting as the members who join them make them. If you don't participate, then you won't enjoy much of the experience. We learn by doing and teaching so ask the questions and do the projects or just collect them for a rainy day when you run out of things to do and we will all have fuller lives. Important request! We need members to go to the Members files in the cyberstitchers-ega group and either create or update their profile in the membership directory for the sunshine committee. June 25-28, 2015 in Olive Branch, MS.
Save the date! Needle "Lil Peace"? Then plan on joining your stitching friends at the Tennessee Valley Region's Share-a-Stitch XXXV. Greater Memphis Chapter is hosting the event at the Whispering Woods Hotel and Conference Center in Olive Branch, Mississippi, June 25-28, 2015. Mark you calender now and plan to be there. Group registrations are now being accepted. Forms are available on the GCC page of the EGA website. 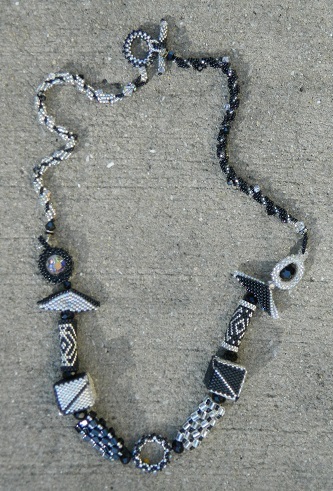 Have you ever wondered what to do with the new types of seed beads that are on the market? 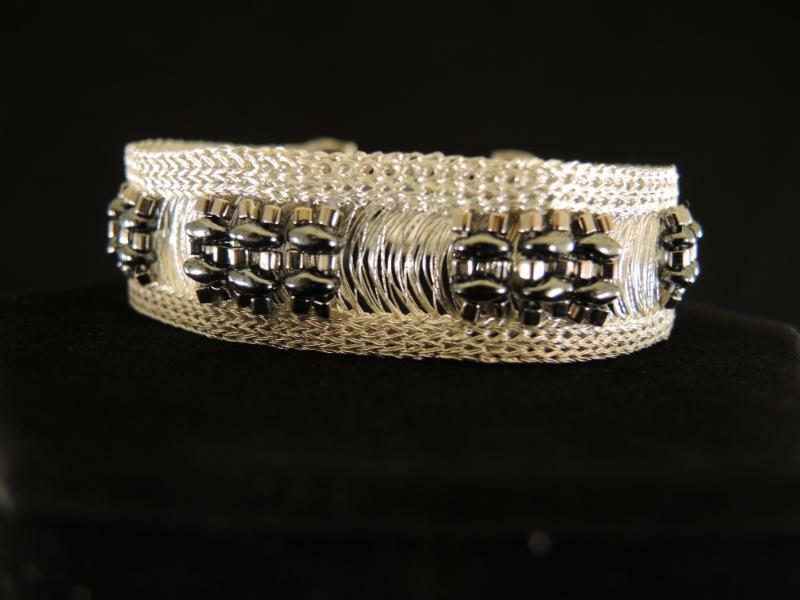 The Dynamic Duo Bracelet introduces you to two of those fun beads ( Twin Beads™ and Mini Cubes) using a new type of wire knitted ground band called WireLuxe™ (pre-knitted wire). You will have three different bracelets to choose from. See theEGA website for more information! Registration for this course will continue through April 13th. After that, kits will be assembled and mailed to each registered student and the course discussion list will be set up on the EGA website. You must be a member of EGA and able to log in to the "Members Only" area of the website in order to access the posted lessons and discussion. The first of four lessons is scheduled to post on May 14. Lessons will remain on the website for several months after the end of the course. If you have any questions, please email education@egausa.org. EGA's 6th International Embroidery Conference will be held May 14-16 in a very special location- Williamsburg VA! Time is limited - registration for this special event ends April 14, 2015. In addition to the 6 fascinating lectures on embroidery and textiles, you will have the opportunity to visit the DeWitt Wallace Decorative Arts Museum to access the "study drawers", concentrating on the extensive Williamsburg Sampler Collection. A Rich and Varied Culture: The Textiles of the Early South This exhibition includes quilts, costume accessories, and many schoolgirl samplers. In the McCarl Gallery of the Folk Art Museum is A Celebration of American Quilts featuring 12 quilts dating from the late 18th century to the 20th century. 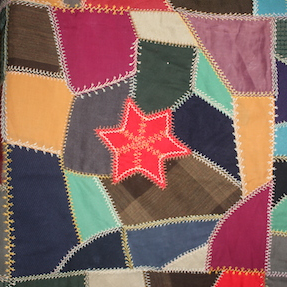 The quilts feature a variety of different techniques and styles from a silk show quilt in a fan pattern, a Hawaiian appliquéd quilt, a wholecloth worsted quilt, and denim work clothes quilt. Our speaker Kim Ivey will be available to give brief introductions in the gallery. 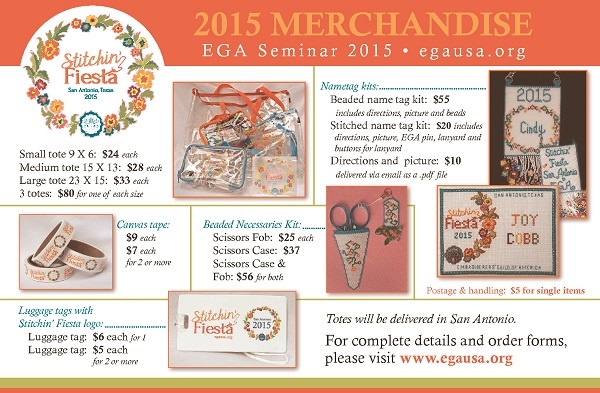 For more information, please visit our web page on the EGA's website. You will find information on the 6 outstanding speakers, schedule of events, and hotel details and aregistration form to print out and mail to registrar Jenna McClooney. Williamsburg is steeped in history, unique architecture, cuisine, fine arts, music, performance, and literature. ....and by the way.....There is a wonderful restaurant called "The Trellis", that is one of the leaders of American Cuisine in Williamsburg. They present a wonderful (famous) dessert called "Death by Chocolate" - a 7-layer chocolate torte with hand rolled white chocolate truffle, chocolate ice cream, and dark chocolate sauce. It has been referred to as "A Study in Chocolate". While you were stuck inside this winter by cold, snow, rain, or just gray skies, did you go "outside the box" with your embroidery? 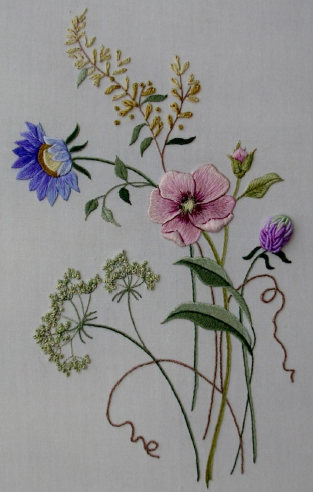 If you created an original work of embroidery with artistic merit that shows your growth as an embroiderer - in other words, you pushed yourself "outside the box" - consider entering one work for the Bobbie Pilling Memorial Award. The electronic entry deadline is July 1, 2015. All submitted works with artist statements will be judged and then exhibited at the national seminar in San Antonio. Further information and theentry form can be found on the Scholarships and Awards page on EGA website or contact education@egausa.org, subject line Pilling Award. 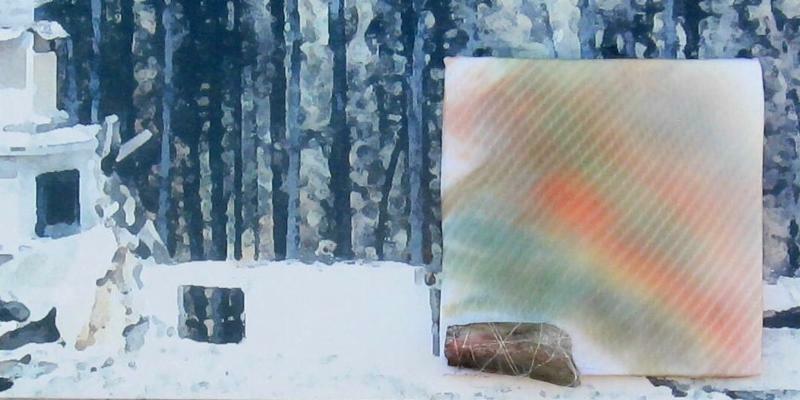 The Embroiderers' Guild of America is seeking work for an international exhibition of contemporary embroidery that features mixed media as its main theme. The exhibit will be on display at EGA National Headquarters in Louisville, Kentucky from February 3 - July 15, 2016. All members of the EGA, the American Needlepoint Guild, the Embroiderers Association of Canada, the Embroiderers' Guild UK, the Association of New Zealand Embroiderers' Guilds, the Australia Embroiderers' Guilds, and the Cape Embroiderers' Guild of South Africa are invited to enter. Guest jurors/curators are Shirley Kay Wolfersperger, Carole Rinard, and Ann Erdmann. More details on the theme and submission requirements are in the call for entries. Click here to download! Bosque Museum in Clifton, Texas, will be holding a juried exhibition of art quilts, mixed media, and contemporary embroidery from June 2 to August 30, 2015. Artists are invited to submit work for jurying. To learn more about the museum, visit www.bosquemuseum.org. Jurying is by digital images; no actual works are sent to the jurors. Top-quality images in high resolution are essential. Cameras should be set for fine quality. We highly recommend the use of professional photographers. Join us at the Wisconsin Museum of Quilts & Fiber Arts in Cedarburg, WI. Exhibits Include crazy quilts, punchneedle, redwork, needlepoint, and counted cross-stitch artwork. Artists Reception May 3, noon to 3 p.m.
For four days, September 13-18, we will focus on felting wearable art with an experienced maestro. We will create wet-felted, painted, sculpted flowers, as well as jewelry with embedded metal findings, strung or embellished. We will create a lightweight, aerial, draped scarf without sewing or hemming, and we will learn resist felting to create hollow or three-dimensional shapes-a beautiful, seamless handbag with a shoulder strap or handle. These felting projects are accessible to students of all levels. Take a peek at this wonderful ESP here. Visit egausa.org for more information!